There is a lot of information on the community pages about PWS and how to get them working. Is there a recommended solution from the community for a device that works best? Looking for a package of everything I need without breaking the bank. Hi Josh, welcome to the community. Overall you can find many different opinions / discussions on pros / cons of different PWS(s), but my personal recommendation tends to be AcuRite 5-in-1 system. Be sure to get a version with a network Hub, like this one (link). Setup is pretty straight forward and it usually comes with everything you need in under $150. The next more affordable option tends to be Ambient Weather systems, with main advantage being a solar battery on some models, but they also come with a potential issue if your neighbor gets one too, more on this here (link). The cheapest “professional” stations tend to be from Davis, but they are not without their own problems (link), and frankly with 5-in-1 sensor being that much more affordable, I prefer to not be as attached to mine and be in a position to afford a replacement at the first signs on trouble. Overall, you are more likely to find a PWS with support for Weather Underground, rather then CWOP or pwsWeather.com which are the networks supported by Rachio. Fear not, www.wufyi.com is were you can relay Weather Underground data to pwsweather network, free of charge and without requiring a local computer. @jfirstenberg - I think a couple of us are watching this one -> https://www.indiegogo.com/projects/weatherflow-smart-weather-stations/#/ It is not out yet and new orders won’t ship until December 2017 or January 2018. They’re just about ready to ship the first half of the system (Air), but precipitation, wind and solar will depend on the second half (Sky) which will be probably eight weeks out. Take @Gene’s comment to heart about replacing the unit as I’ve seen a neighbor’s unit go from being very close to the rain gauge mounted on my fence to being way off. Not sure if there are leaves or other stuff in the rain collection area or if it has fallen out of calibration. And like Gene said, Davis tend to be more professional, but also much more $$$. I think he said he could replace his AcuRite system five times over before he spent as much money as one Davis system. So how close is the nearest NWS (National Weather Service) station to your location? Thank you @Gene and @DLane The nearest NWS station is about 15 miles away. Trying to balance the cost of RACHIO and a PWS with the benefit it would create. One thing you could check as well is wunderground stations in your area. I’ve written what to look for here (link). If you have a good quality station in your area, but it is not yet part of one of the weather networks supported by Rachio, you can still use it via www.wufyi.com, without needing to purchase your own. Hi Gene … I’m really a novice. I went to PWSweather.com and setup my station but it does not seem to be working. I don’t really know what to put in some of the fields and I can’t find any place where they are described. I used the station ID from Wunderground but I don’t know what goes in the URL field. Do you have any advice for me? I’d really like to use wufyi if I could get PWSweather to work. Hi Randy, yes sorry, I know setup should be easier / self explanatory, but I didn’t yet get a chance to improve it. The trick is to customize the example URL found at www.wufyi.com or www.beta.wufyi.com (advantage of beta URL is that it does not require a wunderground API key, thus allowing you to avoid one whole step). Otherwise you will get a notice about an error (such as wunderground station being wrong, or pwsweather password being incorrect…). If you see an error, check the parameter you are trying to use, or email the URL you are trying to use to setup@wufyi.com and I’ll help you further. When you are finished customizing your URL, you will need to periodically request it. 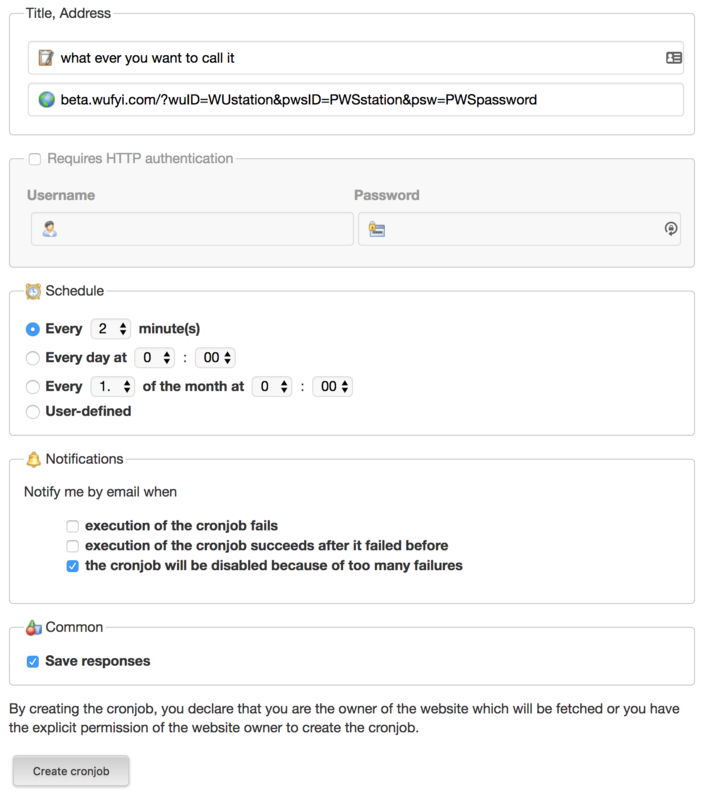 This will trigger a one time data transfer between wunderground and pwsweather, each time your custom URL is requested. This is it. From now on just check back if you see an issue, otherwise data should be transferring automatically in the background. Again, don’t hesitate to contact setup@wuyfi.com in case you run into any issues. 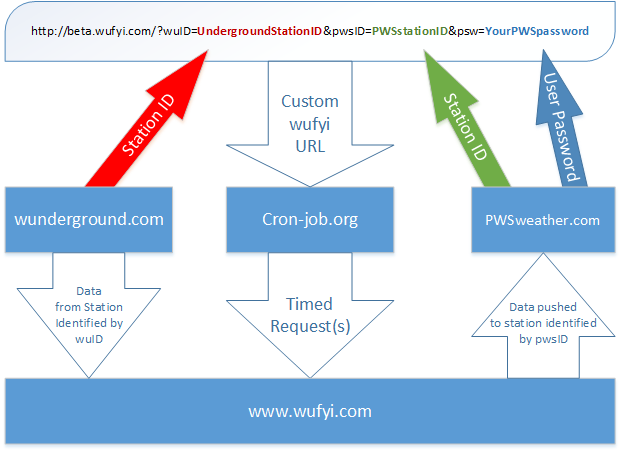 Note that all of the customization for the data exchange are done via a custom wufyi URL, which gets specified within the cron-job setup.